Microsoft’s new gaming and media console will be called Xbox One and will launch “later this year,” the company announced at an event on its campus in Redmond, Wash., this morning. The event, Xbox: A New Generation Revealed, began with a video message from Microsoft employees, celebrities and Xbox players. “For the first time, you and your TV are going to have a relationship,” one of the employees said in the video. 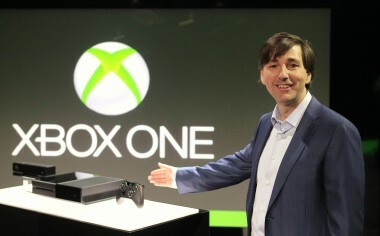 “Today, we put you at the center of a new generation in the living room,” interactive entertainment president Don Mattrick said in a welcome address. The device is a sleek black box that sits horizontally on the table, with a Kinect mounted on top; the accompanying game controller is also black. However, marketing CVP Yusuf Mehdi demoed voice and hand-gesture controls, directed at the Kinect attached to the Xbox, that are intended to replace remotes. Users will turn the console on with their voices by saying “Xbox on.” When they say things like “Xbox, movies,” “Xbox, game” or “Xbox, TV,” the console launches the appropriate media service. The short version: “Games, music, movies, web, and now, Skype and live TV.” As predicted, this is an uber-device for the living room, not a games-focused console. Mehdi also demoed the ability to open multiple services simultaneously. While watching the first Star Trek movie, he received a Skype call from a coworker and opened Internet Explorer to look for tickets to the new sequel. The motion-sensing Kinect will be bundled with the Xbox One, and now understands human motion better — including what it looks like when humans balance — and has the ability to use heartbeat data. More than 300,000 servers will power the new Xbox Live experience on Xbox One. A built-in DVR lets players record and rediscover videos of their gameplay. And a few specs: 8 gigabytes system memory, 500 GB hard drive, a Blu-Ray drive, HDMI in/out and USB 3.0. Nearly half an hour into the talk, games finally took center stage, by way of EA Sports’ Andrew Wilson, who announced “revolutionary” versions of the company’s pro sports games, powered by a new engine called “EA Sports Ignite.” Then, Microsoft Studios’ Phil Spencer said his studio will be releasing 15 exclusive games for Xbox One in its first quarter, eight of which are new franchises. Xbox Entertainment Studios’ Nancy Tellem then took the stage to talk about how TV on Xbox will be more immersive and social. “Xbox is about to become the next watercooler,” she said. A live-action Halo TV series, produced by Steven Spielberg, will be coming to Xbox. A partnership between Xbox and the NFL will integrate live game broadcasts with fantasy football. That multi-service feature Mehdi demoed will show fantasy scores auto-updating as the game on the field evolves. The “one more thing” (if such a phrase is not verboten at a Microsoft event) is that the downloadable content for Call of Duty: Ghosts will come to Xbox One first. 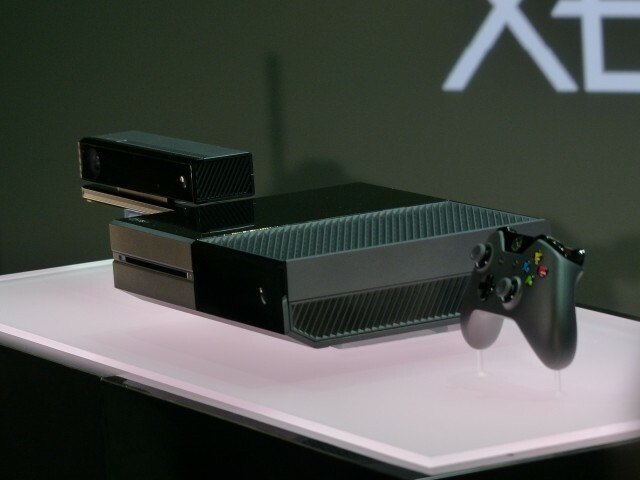 Microsoft said more information about the Xbox One would be released at the industry conference E3 next month.